Consumer Report Smitten By Toyota’s Electric SUV. In fact, Consumer Report, CR starts with a strong statement: “A smooth-running Toyota RAV4 that does not consume gasoline is now at dealerships, and we recently borrowed one to sample at our test track. And so far, we're seeing real appeal in an electric sport-ute.” With only 2,600 examples up for lease in selected dealerships at shy of $50,000, Toyota is sending the alternative energy community mixed signals again. Having just declared it would not continue making electric cars since demand wasn’t high enough according to the company, Toyota delivers an electric SUV that shows the potential of the electric drive. RAV4 EV Performance. When it comes to gasoline SUVs, certain owners might be familiar with torquey accelerations but one thing SUVs are not known for are their ideal handling. The only SUVs that achieve such poise are mostly left to the Porsche Cayenne and the up and coming Maserati Kubang. This is where the Toyota RAV4 EV will surprise many. It has strong and frank accelerations, no doubt do the Tesla drivetrain but it also handles very well despite added weight. I’d even be willing to bet most current RAV4 gasoline owners might prefer the electric version. 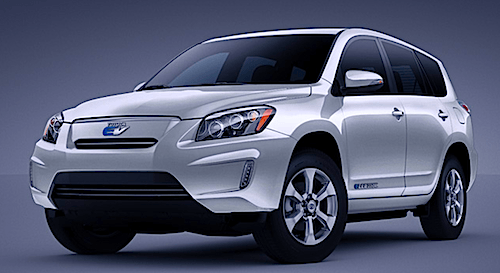 Whether or not the Toyota RAV4 EV is a compliance electric SUV is not important. The fact it is out the door, at least if only in California is the point. If enough people test drive this electric SUV, it will most likely change their minds about EVs and understand that famous EV grin. In the meantime, Toyota’s insistence on saying electric cars are not ready and public demand is too shy might just be a moot point when a few loyalists spend some time behind the wheel of this Toyota RAV4 EV. Of course, no comments from the peanut gallery who had all kinds of things to say about how crappy CR is when they called out the Karma. Or saying how Kirby is better than a Rainbow?